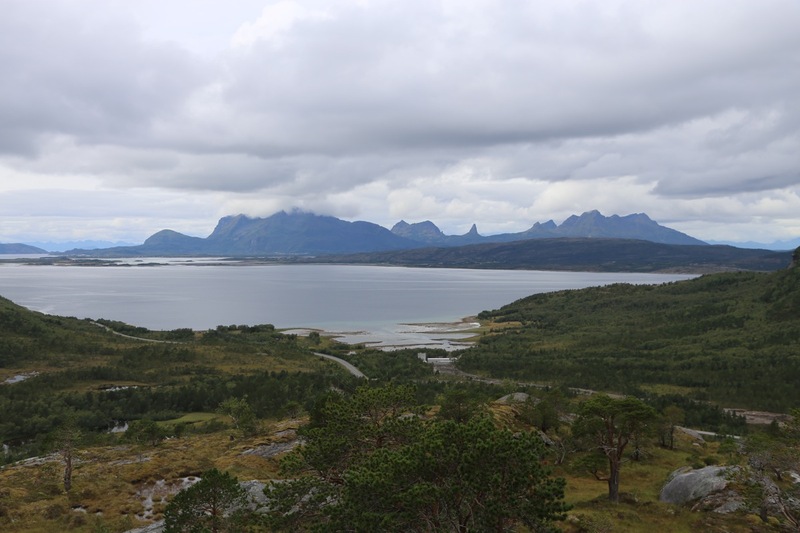 Steigen is connected to the rest of Norway via an 8 kilometer long tunnel. Drive through this tunnel and turn left onto a small dirt road immediately after you exit the tunnel. Park where you do not block anything. One possibility is to drive up the short, steep hill and park outside the hydro power tunnel. This location is N67.94473, E015.67608, elevation about 80 meter. Follow the small powerline that runs perpendicular to the hill on the road. You need to cross a fence, then continue to a larger power pole construction. Pick up a clear trail here that will take you uphill on the left side of the creek. When you get up the steeper part of the hillside, start going more left. 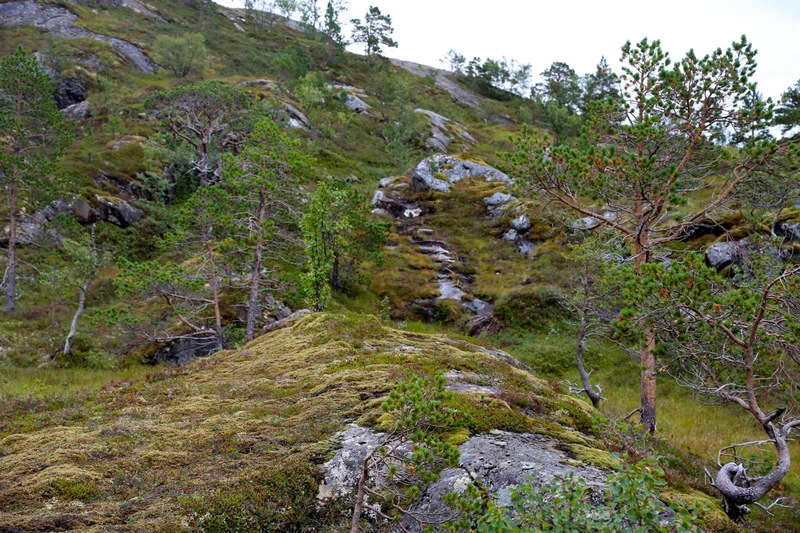 There is a large lake, Forsanvatnet, further uphill, but you should turn left before seeing this. Aim for the trees below the steep front of Lille Forra, pick a natural, traversing line that also climbs, staying below the boulders immediately below the cliffs. There are small sheep trails here. You will cross between a few big boulders, but most of the way is quite easy. Gain the lower part of the very wide gully that runs down on the north side of the peak. Head directly up the middle, the terrain is surprisingly nice, it is easy to walk up here. 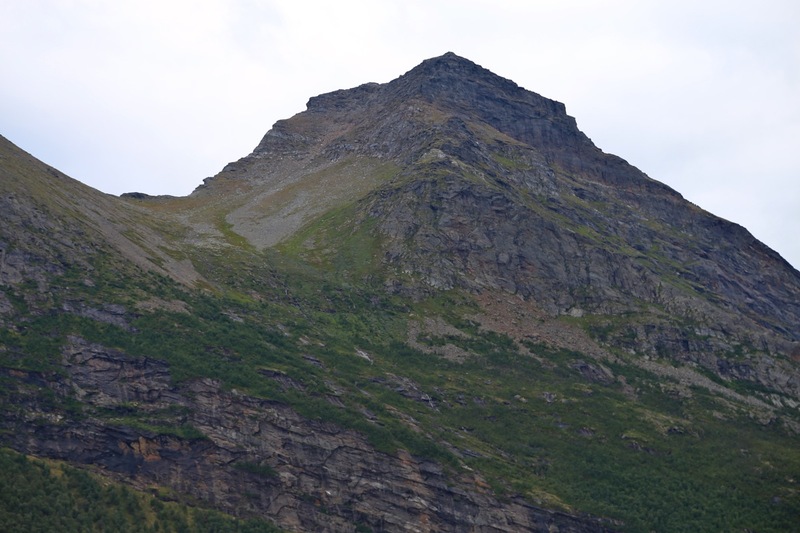 As you get closer to the ridge on your left side, turn more right and continue to ascend on somewhat steeper terrain. Higher up, it may be better to keep left as the rocks in the middle may be a bit unstable. Continue uphill (now more steeply) until you reach the main, fairly flat ridge/col. From here, turn right and follow the short summit ridge. There is some easy scrambling here, but if you follow a few small, local ramps, the difficulty stays at (YDS) class 2+. Finally, the cairn is straight ahead at the end of a fairly short, level section. 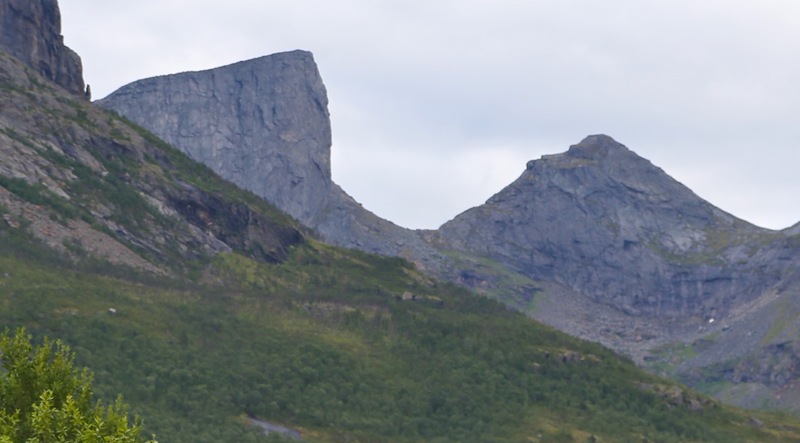 The original plan was to climb a few peaks in Jotunheimen, but a rather miserable forecast made me change plans and fly to Bodø. 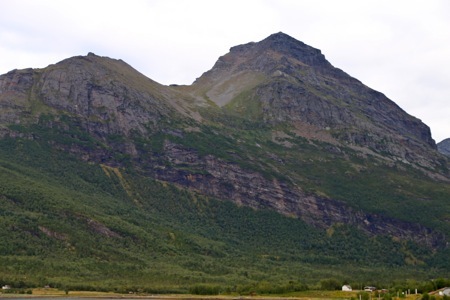 I arrived shortly before noon and hoped to climb Lille Forra on my way to Bogø where I would stay with Nina and Agnar. Nina is a close friend of my wife Heidi since early school in Trondheim. My flight (to Bodø) was a bit late and it was 1420 before I was ready to start my climb. Fortunately, the terrain was quite agreeable and I made good progress. 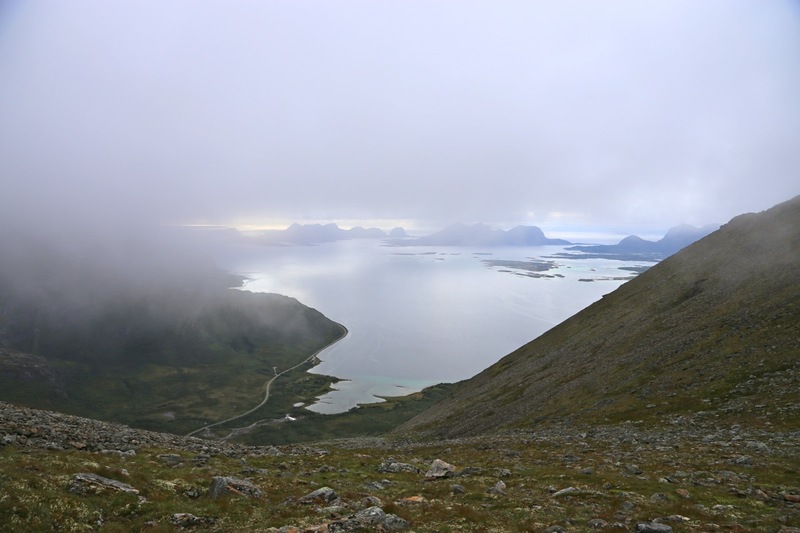 The view out the fjord got increasingly better, but with low clouds overhead I realized that the upper part of this climb would be in the fog. The first part of the wide gully going uphill was excellent, no rocks and easy walking. 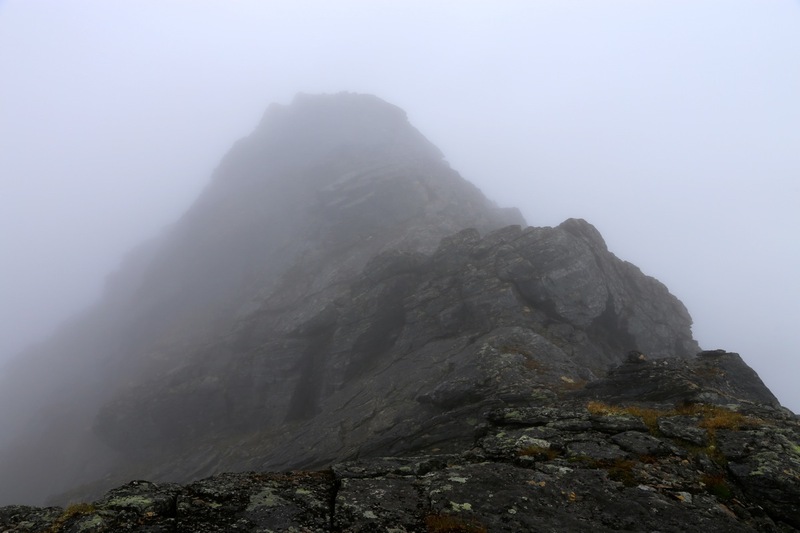 Higher up, as I entered the clouds, the hill got steeper and the rocks were a bit slippery and also quite loose. I prefered to walk on steeper gras and stayed mostly on the left side. 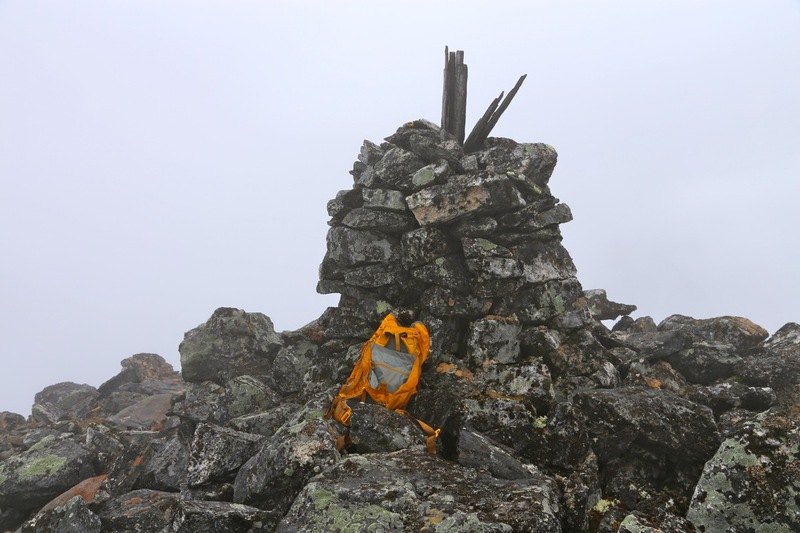 Once on the top col/ridge, around 1645, the rest was easy and I arrived at the summit just before 1700. The view was better than expected, a few peaks were visible between the clouds. I stayed around for 10 minutes, then started my descent. 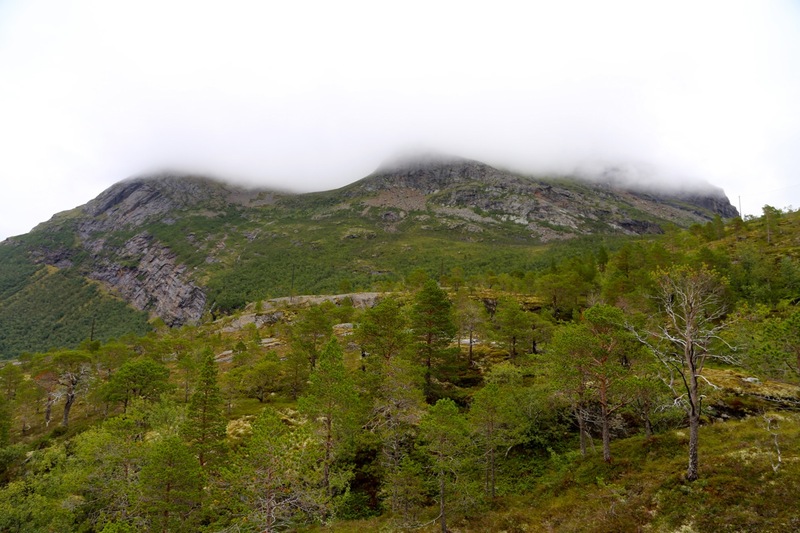 Nice to get back below the clouds and continue my drive to Nina and Agnar. 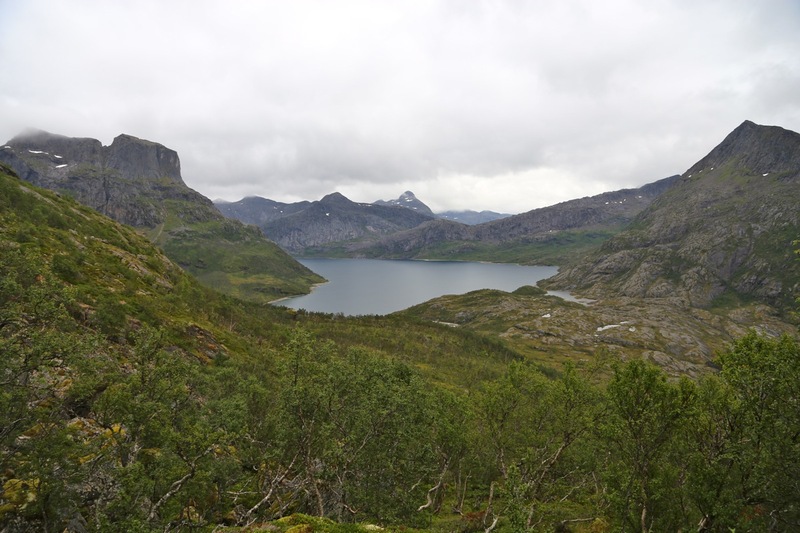 I was back down at 1920, then on my way to Bogøy. Lille Forra, as seen from the road. The route is clearly visible. Lille Forra, the upper part. Peaks, on the ridge going south from Lille Forra. Peaks continued, on the ridge going south from Lille Forra. 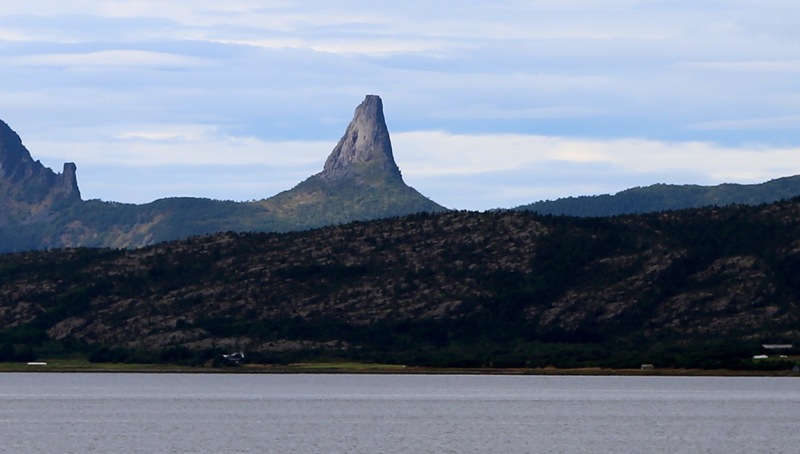 Hamarøyskaftet, a famous local mountain. Viewed from the road below Lille Forra.